1000 eye injuries occur every day in U.S. workplaces, according to OSHA estimates. Injuries range from eye strain to severe trauma that can cause permanent damage, vision loss, & blindness. 40% occur in the construction, manufacturing, and mining industries. $300 million cost per year in lost productivity, treatment, and compensation. 1/3 are treated in hospital emergency departments. 80% of work place eye injury victims are men between age 25-44. 1 million Americans have lost some degree of their sight due to an eye injury. 70% of American adults experience eyestrain from electronic devices. 90% of on-the-job eye injuries could be avoided if workers wore eye protection. 3/5 of workers who suffered eye injuries were not wearing eye protection at the time of the accident. 40% of the injured workers were wearing some form of protective eyewear when the accident occurred. 90% of the injuries to workers wearing protection resulted from objects or chemicals going around or under the protector. The majority of eye injuries result from small particles or objects striking or scraping the eye. They are often ejected by tools, windblown, or fall from above the worker. In addition, objects can go through the eyeball and result in a permanent loss of vision. Collisions with large objects or projectiles can result in blunt-force trauma and cause permanent loss of vision. If you are working in an area that has particles, flying objects, or dust, you must wear safety glasses with side protection (side shields). If you are working with chemicals, you should wear goggles. 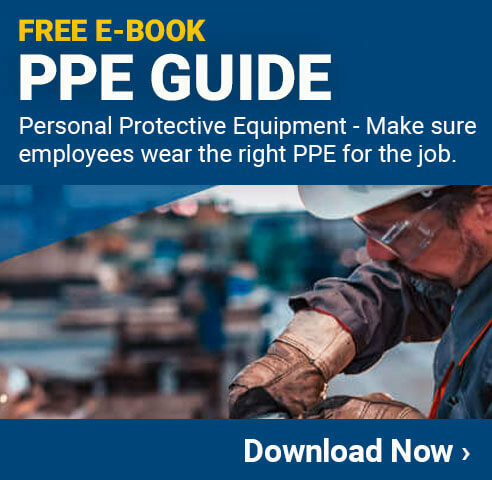 If you are working near hazardous radiation (welding, lasers, or fiber optics), you must use special-purpose safety glasses, goggles, face shields, or helmets designed for that task. Position your computer monitor 25 inches away. Follow the 20-20-20 rule: Every 20 minutes, take a break by looking at an object 20 feet away for 20 seconds. Reduce glare on your cell phone, computer, or digital device. Adjust environmental lighting near your workstation. Eliminate hazards before starting (machine guarding, work screens, or other engineering controls). Post “Eye Protection Required” signs throughout your facility to create awareness. Select protective eyewear that is designed for the specific hazard and meets current standards. Eyewear needs to fit properly and be in good condition. Conduct ongoing educational programs to create, keep up, and highlight the need for protective eyewear. Add eye safety to your regular employee training programs and to new employee orientation. Once your safety program is created, put it in writing. Management support is key to having a successful eye safety program. Create a 100% mandatory program for eye protection in all operation areas of your facility. Set up first-aid procedures for eye injuries. Install accessible eyewash stations where chemicals are used. Train workers in basic first-aid and identify those with more advanced training. Where workers’ eyes may be exposed to injurious corrosive materials, employers must provide suitable facilities for quick drenching and flushing of the eyes (e.g., an eyewash station) within the work area for immediate emergency use. Eye and face protection must satisfy the requirements of ANSI Z87.1-2003, ANSI Z87.1-1989 (R-1998), or ANSI Z87.1989 unless the employer can demonstrate that the protection is at least as effective as those constructed according to ANSI Standards. If an eye injury occurs, seek medical attention immediately, even if the eye injury appears minor. Delaying medical attention can result in permanent vision loss or blindness. If you get foreign material in your eye, it can become embedded in the surface of the eye and cause ongoing irritation. DO NOT rub the eye. Doing so can cause more damage. Blink several times. Allow tears to flush out the particle. Lift the upper eyelid over the lashes of your lower lid to let the eyelashes try to brush the particle out. Use eyewash, saline solution or running tap water to flush the eye. See a doctor or go to the emergency room as soon as possible if you can’t get the particles out of your eye or if it still feels like there’s something in your eye after you’ve gotten the material out. Injuries other than grit in the eye or small scratches to the eye should be considered potentially serious. DO NOT try to remove any objects stuck in the eye. Over-the-counter eye drops can be more painful or make the injury worse. Prescription medications should only be used for exactly the condition they were prescribed for, not for emergency treatment. See a doctor as soon as possible. If you can’t get to an ophthalmologist right away, go to the emergency room. Don’t use steaks or other food items. These can get bacteria into the eye. If a black eye, pain, or visual disturbance occurs even after a light blow, immediately contact your ophthalmologist or emergency room. Even a light blow can cause a significant eye injury, like a retinal detachment. Gently place a shield (protective cover) over the eye. The bottom of a paper cup taped to the bones surrounding the eye can serve as a shield until you get medical attention. Do not press the shield against the eye. Don’t take aspirin, ibuprofen or other non-steroidal, anti-inflammatory drugs. These drugs thin the blood and may increase bleeding. After you have finished protecting the eye, get emergency medical help. Immediately flush the eye with plenty of clean water. Look for information on the chemical that got into the eye as some chemicals cause more eye damage than others. Next post Are you up to date with OSHA?